In his recent conference at the Nordic Business Forum in Stockholm, the Apple Computer co-founder Steve Wozniak said that he has sold all his Bitcoins, that he once bought for $700. As per the price, he must have carried out the purchase either in June, or late October-early November of the year 2017. Although, he never revealed the quantity he purchased but he did say, “I remember getting interested in bitcoin some time ago. It was $70 for a bitcoin, man and I went online and you had to have a special bank account at a special bank and I couldn’t buy any bitcoin so I gave up. Eventually I got some of them at the $700 stage and it went down to $350. I didn’t invest, I did it so I could play with bitcoin,” in an interview in June, 2017. 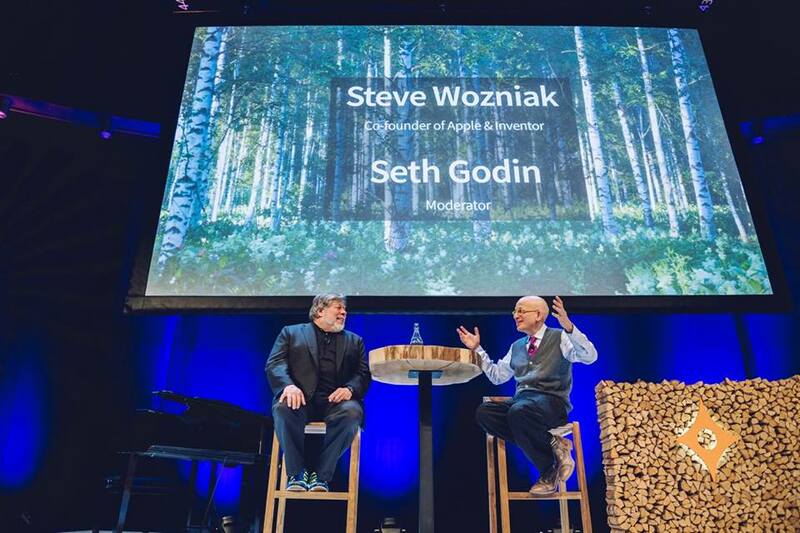 Steve Wozniak in an interview with Seth Godin at Nordic Business Forum in Stockholm, January 24. He also said that he just wanted to experiment with it, since he likes the blockchain technology and “admired” the blockchain technology. Even earlier at a conference in Las Vegas, Woz said that he thinks Bitcoin is better than gold or even US Dollars, which he called too “phony” because government can always print more! Soon after the Bitcoin market went nuts, rising as high as $20,000 per Bitcoin, Wozniak couldn’t get a hold of it and cashed it all out. Even if he purchased 1 Bitcoin, he could have made $19,000 profit on it. “When it shot up high, I said I don’t want to be one of those people who watches and watches it and cares about the number. I don’t want that kind of care in my life. Part of my happiness is not to have worries, so I sold it all and just got rid of it.,” Wozniak told Seth Godin over the stage. “I’ve never been into money in any way. I’ve never used Apple’s stock app, I don’t buy and sell stock,” Wozniak added. “The Power button on the iPhone X does different things depending on if you are asleep or awake, you double-click it, you give it 5 clicks – this is so against the philosophy I grew up with. Don’t even get me started on navigation systems,” Woz said in Stockholm.